Last weekend a doll friend and her husband came for a visit. So, the week before that I cleaned, dusted and reorganized a couple of my doll cabinets. I wanted to share pictures of how nice they look, but I have not mastered photographing big stuff yet. Here’s a fuzzy picture of my big cabinet. It was my grandmother’s china cabinet which my mom had professionally refinished when she inherited it. Taking pictures of the wall cabinet where I keep my tiny dolls is even more problematic. It has a mirrored back which shows off the dolls, but makes it even harder to take good pictures. Let’s talk bamboo, real and faux. In my wall cabinet, I have seated my 2 new wooden dolls on a real bamboo chair that is part of a set. Real bamboo furniture, even if it is old, usually doesn’t cost much. On the other hand, old faux bamboo furniture, especially miniature, is valued. I know, real bamboo is cheap because it is a persistent weed and faux bamboo requires a certain amount of craftsmanship. But, I still think it’s weird. In the big cabinet, on the bottom shelf behind my Christmas Fairy, I have a faux bamboo armoire. It is a bit crudely made, but I like it. It is fitted inside with linens and pottery. The pottery pitcher is marked “Made in France”; the other pieces are unmarked plain white pottery. The “linens” are probably a polyester blend and have glued on nylon lace and silk ribbon trim. So, the inside was obviously redone in the last 40 years or so. And one day I will tackle redoing the inside with nicer materials as a linen closet or a clothes closet for one of my dolls. This tiny cabinet is a dollhouse miniature-sized, hand-painted cabinet decorated by Rosemarie Torre several years ago. It shows that I was attracted to decorated boxes with loads of tiny drawers long before I even knew 17th-century Embroidered Caskets existed. On the casket front, I have made progress on my technical drawing. It is going very slowly. So far, I have plotted out 28 of the 161 pieces and it has taken me almost 2 full days. Hopefully I’ll get faster as I become more comfortable with the program I am using. I have also done a tiny bit of work on the embroidery for my 17th-century Bru Fairy’s smock. I had to erase and redraw the pattern since it had been so long since I worked on it. I really want to get it done, but working on the tedious task of computer-aided drafting and minuscule embroidery at the same time may not be the best idea. My new, not broken, mini digital table saw came today. I found this note inside the outer box and it made me smile. I wonder if “Super Pack” is anything like a super PAC. I sure hope not. Well, anyway, it arrived safely and it is beautiful and I love it. Now I just need a warm day to take it outside and get to work. 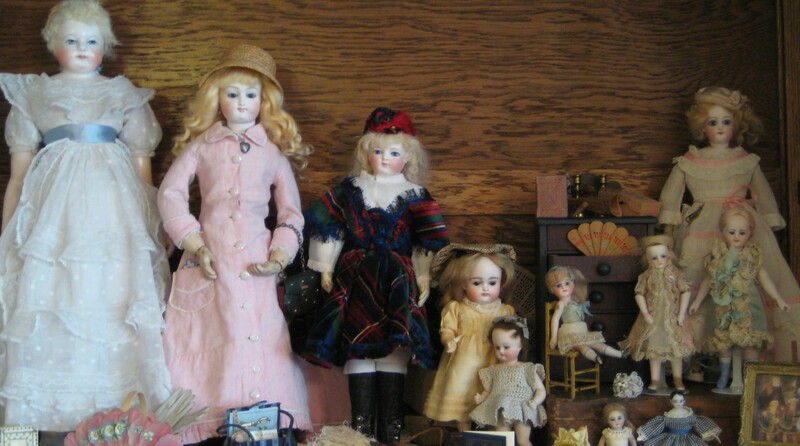 I’ve enjoyed seeing your Dolls! Is that a Queen Ann Doll I spy? Maybe some day you could do a show and tell on her. Yes, you’ve taken on quite a bit, all depends if the pressure makes you work better or not?! Hi Caty, The Queen Ann is a wonderful reproduction. As far as multi-tasking, it doesn’t stress me out at all. I really like having lots of different projects to work on at a time. I just can’t go from one finicky project to another finicky project on the same day.